A Rewind on the cult classic "Nayakan"
Nayakan, a film which I watched after 27 years of its release for the first time. There are people till date who claim it to be flicked from Godfather. Then I’d say Godfather is flicked from the stories based on ‘Five Families’. Every nook and corner there’s going to be a cop and there’s going to be a gangster which could turn out to be a classic cult story or end up just another garbage. If the critics accept Francis Ford and Mario Puzo took it out from ‘Five Families’, they also got to admit that Mani Ratnam took it from “Varadaraja Mudaliar”. From a meager movie buff like me to the greatest movie mentor I know (Gautham Menon) everyone has admired and worshiped ‘Nayakan’. Nayakan is like a path-breaker in the Tamil industry which made dozens of people pick the profession and come into films during the 90s. I could strongly say Mani Ratnam didn’t flick the storyline from Godfather. He explains it in an Interview, "Post the huge success of Mouna Raagam, I was planning to reach the nook and corner of Tamilnadu since the Mohan-starrer was accepted by the people. Indeed I planned a commercial film to make and that was “Agni Natchathiram”. When Agni Natchathiram was at its final stages, Kamal Haasan came in and asked to do a story for me through producer Mukta Srinivasan. Though it was a call from Kamal it was a unique one as I expected. He gave me the cassette of Pagla Kahin Ka and asked whether I was interested in remaking the film. Since I was not interested in remakes, I watched it for the sake of Kamal and immediately the next day I informed his producer that I'm not in. Producer Mr. Srinivasan took me to AVM where Kamal sir was shooting. When I met Kamal, I told him immediately without a hesitation that it wasn’t my thing. Kamal asked me, “What was your thing then? He also added up, "The cassette was a thing which helped me to start a conversation with you”. Later I told him, ‘I have two ideas for you, either a Bondish Beverly Hills Cop or the story of Varadaraja Mudaliar’. He also explains the reason behind making the story of Mudaliar, "During my 1975-76, I did my MBA at Mumbai and during those times the people at Matunga belt believed Mudaliar was God. I used to hear the story of him often from random people that he came from TN as nobody and he has raised up to a demigod status. The story of him fascinated me a lot and that's something I always wanted to make." Scanning old articles and speaking about how the movie was made will make this article a very long one and hence from this point, I would like to make this column a more informative and Trivia based one! -Mani Ratnam was supposed to cast Kamal already in Pallavi Anupallavi but due to Rajapaarvai he couldn’t. -Agni Natchathiram and Nayakan were shot simultaneously. Since the director and DoP were not satisfied with the outcome of the "Ninnukori" song's visuals, they stopped shooting Agni Natchathiram and started concentrating completely on Nayakan. -Kamal has his own pistol and he uses it in scenes is just another trivia revealed by Mani Ratnam in the same Interview. -In a newspaper's Interview, Kamal said he was unsure of Mani as a director until the shoot of “Naan Sirithal Deepavali” song. -Raghuvaran was supposed to be cast instead of Nasser in the movie. Kamal is the person who insisted the change. 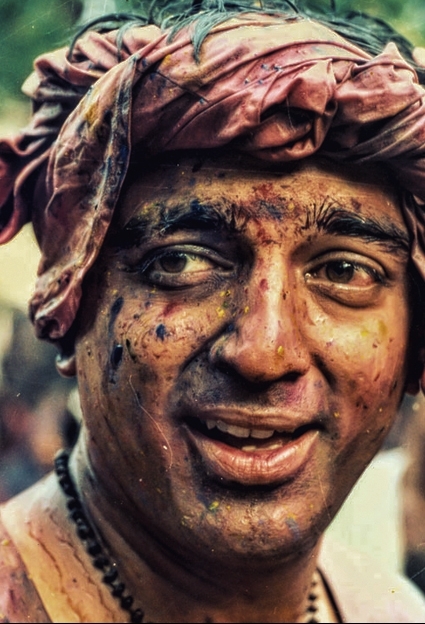 -Most of the scenes were shot at a Dharavi set in Chennai made by Thotta Tharani. The idea was to show the iconic places of Bombay and to make the audience trust and also make them have a feeling of the ambiance in Mumbai. Later it was all shot in Chennai. -The old Taj hotel at Mount Road plays an important role in the movie. It was the location where most of the scenes were shot. It was opposite to the Indian Express office and it was called the Indian Express building in the industry. -To make the pigeons look lively, several of those birds were bred in the location pretty long before the shoot was planned. -Three days of shooting were planned and by that time Mani Ratnam wasn’t even ready with the complete script. So Kamal and Mani Ratnam had a test shoot at Mumbai even before the original shooting commenced. -PC Sreeram handled the lights whereas the duo was shooting for both Nayakan and Agni Natchathiram. Nayakan was a periodical one and they shot it with a sepia tone throughout whereas Agni Natchathiram was an updated one and they made it look futuristic. -PC Sreeram’s cinematography would be remembered forever since he had made the film in a way that even in a generation loss in prints the contrast of the picture looks dramatic enough and fresh as well. The movie was noted for its frame within frame filmmaking. -Mani Ratnam doesn’t watch his films after release and it applies to Nayakan too. He has watched few pieces for identifying the mistakes he made but never the full movie after its release. He calls it useless because that he can’t change anything after the release. -Nayakan was Ilayaraja’s 400th film. -The film was a Diwali release. The death of Velu Nayakar was not on paper but he felt somewhere between the shoot that death is probably the best place to finish. In an interview to Mr. Baradwaj Rangan, Mani Ratnam said, “I had two plus hours to say whatever I wanted to say”. -The film released on 21 October 1987 where it was a Diwali day along with Superstar Rajnikanth’s Manithan. -Nayakan's Hindi Remake Dayavan was a huge disaster at box office. -Mani Ratnam also confirmed there’s not a possibility at all to make a sequel to this film. -Nayakan was India’s submission to Oscars at 1988. -Hats off to Mani Ratnam for doing it so strong, Nayakan's storyline and screenplay remain impactful even for today’s generation. And yes, the movie is something which would inspire thousand towards cinema. "MOST OF THE TRIVIA AND INFORMATION WERE SOURCED FROM BARADWAJ RANGAN'S "CONVERSATIONS WITH MANI RATNAM"